The Sailor Moon Eternal Edition Manga was supposed to be out next week, on January 30th, but unfortunately it looks like it’s been delayed until April 24th! Listings on Amazon have been updated to reflect this new date as have the description of the first volume on the publishers Kodansha and Penguin Radom House’s web sites. No explanation has been given as to why there is a delay but some have speculated that it might be because they are waiting to get the best possible translation. The bilingual Japanese/English version was released in Japan already. It remains to be seen if that updated translation is likely to be the one used for this Eternal Edition. If it is in fact that same translation than it seems unlikely that waiting for it was the reason for the delay. 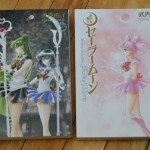 What, you may be asking, is the Eternal Edition and why do would you want it if you already have a copy of the Sailor Moon manga? I covered this in a post last May, speculating that the English Eternal Edition would be similar to the Japanese Complete Editions. 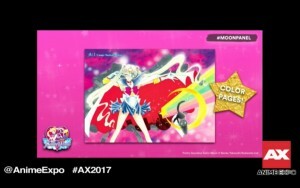 It has since been confirmed that this is indeed the case as the image above from the Moon Panal at Anime Expo in July shows us. These versions will include larger pages, a glossy very white type of paper and most importantly all colour pages from the original issues of Kodansha. Usually only a handful of colour pages are included with a manga release so this is a nice addition. 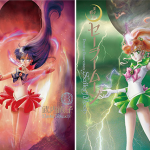 These versions will also include the new cover art which was drawn by Naoko Takeuchi. We can see from the cover art included in the existing listings and they match what was in the Japanese releases. Following the release of volume 1 on April 24th we’ll also be getting volume 2 on May 29th and volume 3 on September 25th. It would only be logical for the following volumes, up to volume 10, to be released at regular intervals following that. 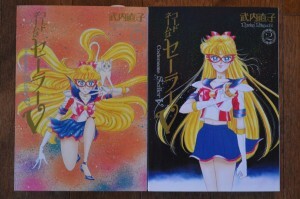 A Japanese Complete Edition of Sailor V was also release and it would certainly be nice if these were released in English as well. Do you plan on picking up these Eternal Editions? 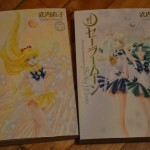 This entry was posted in Merchandise, Sailor Moon Manga and tagged Sailor Moon Eternal Edition Manga, Sailor Moon Manga Complete Edition by Adam. Bookmark the permalink. No manga company in the history of manga has ever released an English translation all at once. It takes time and money to make a translation and you are being entirely unrealistic in your expectations for the manga to be re-released. The colored pages are just a few special pages at the beginning of the book and not the entire manga. If you don’t want to double dip for it, that’s your decision but you should check your facts before you fly off the rails against Kodonsha USA. That’s disappointing. I was hoping the entire thing was gonna be colored – at least that’s the consensus I’d taken from the details I’d read around the interwebz. Still, the semi-gloss will be a nice touch. There is a fully coloured version of the first manga story that was shown at an event a few years ago but no news on there ever being any plans to actually publish it. I know they coloured the Akira manga back in the day. A neat effort but I’m not sure there’s a big market amongst purists for colourized versions of a black and white manga. I guess if people watch special edition Star Wars movies anything could happen! Yes, that’s true. Good point. I’ve had mine pre-ordered for awhile now. Thankfully I did the first volume before the price increase (I think it went up about $10 per volume) Should have preordered Volume 2 when I had the chance to at $17! The last two translations have been less than satisfactory, with fans by far doing the series better justice with free translation and usually faster! Chiaki Kon will be in Huston Texas for Anime Matsuri 2018, which takes place on March 29 til April 1, so fingers cross they reveal something on this panel or even before that as I doubt they reveal something in USA before in Japan, but who knows. 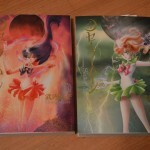 In one of the 2 part films, I hope either one of the Sailor Guardian be in a bikini or bare their midriffs. There are absoluteky no beach scenes in Dreams arc and these being movies I doubt they will have time for anime original. if toei new about you they would have released tons of merch with our girls on bikini. I figured it out. You have an attitude on the side of your body to go with your insults insides! To be quite honest Luke I would love them to use more fashion on the show, the manga is full of it, including eisque lingerie and swim suits. Well! So much for getting the first book in time for my birthday. Ah, well. Wait… WHUT?! There are bilingual editions?? Yes. Published in Japan they have English text inside the word bubbles with Japanese on the outside of the normally visible page. 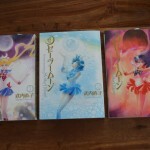 Only the first volume was released to date. Will definitely check this out at the bookstore and give it a once over. My 2011 editions will essentially be obsolete if I buy these new ones, so it feels kinda like a scam. Is there any indication of how the names will be translated in this version? Or are there any versions of the manga in which Usagi’s name (and all the other names) are their Japanese ones and not “Bunny” or any other translations? I’ve no idea if this is the place to ask but I really want to know if there’s a version like that available somewhere. The most recent release in Japan is the bilingual version. 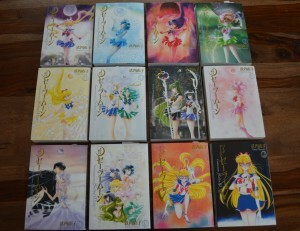 They use Usagi as did the versions released a few years ago. I don’t think stuff like “Bunny” hasn’t been used since the Tokyo Pop days. I was reading them in French back then and there were quite a few similar name changes. They also used “Bunny”.